In October 2007, Hayden Panettiere, spokesperson for The Whaleman Foundation and its “Save the Whales Again!” Campaign, created an international media frenzy when she and five surfers paddled out into the blood filled waters of Taiji’s notorious dolphin killing cove. The peaceful demonstration turned violent when the fishermen attacked the floating protesters with poles and spinning propellers. The moment was captured in “The Cove”, which won the 2009 Oscar for best feature documentary. Hayden and Jeff Pantukhoff, Founder of The Whaleman Foundation, then went back to Japan. Here’s Hayden’s first-hand account of the trip. “I wasn’t sure what to expect on my trip back to Japan. I think a lot of people assume that I hate Japan, or would want to boycott Japanese products because of my issues with their dolphin hunting policies. But really, nothing could be further from the truth. It’s a beautiful place—the people there have such an intense appreciation for nature. I absolutely love it. I think the media likes to paint a picture of West vs. East—Us vs. Them. But I think we all have more in common than that. I wanted to take this trip to reach out to people in Japan that feel the same way. You see, the majority of people living there don’t know about the dolphin hunts, and would never condone them if they did. And for the few who do eat dolphin meat, there is a serious human health concern. Dolphin meat is highly toxic and isn’t safe for people to eat. And the larger issues surrounding the hunts—the captivity industry, mercury contamination, and the burning of fossil fuels—are global problems that we all need to work together on. So this trip was about opening communication channels and building bridges. 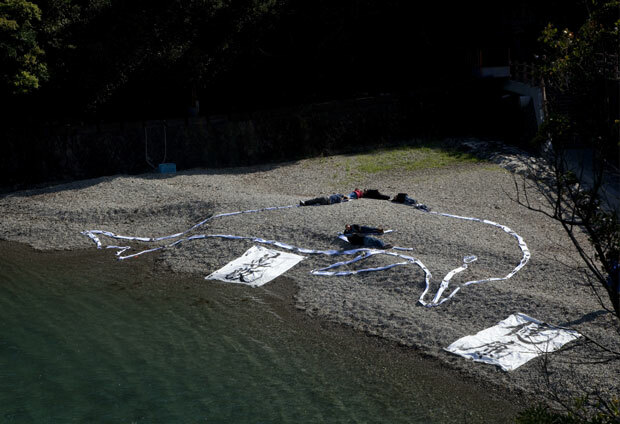 But I knew to do that, we had to at least try to have constructive conversations with government officials in Taiji. In the weeks leading up to the trip, we called the Taiji’s Mayor’s office and the Fisherman’s Union representatives to ask if we could meet with them, but we were turned down. We felt strongly that the Japanese people needed to know that we were serious about engaging with city officials; so we went anyway—with several Japanese TV crews and journalists in tow. When we got to the Mayor’s office, we politely asked to meet with him, but were again turned down. Then we went down the street to the Fisherman’s Union Hall to ask to meet with officials there. When we got to the union hall, it was completely locked up—even though it had been open for business minutes before. As I knocked on the door, several men were seen shooting photos from a 3rd floor window, but they never opened the door. The fact that the mayor and fisheries reps wouldn’t meet with us is strange to me. They have complained that the international press and “The Cove” were biased and had not fairly reported the locals’ side of the story. We then ended the day with a visit to the whale museum where they keep captive dolphins on display. I am totally against these facilities, but when I saw the dolphins swimming around in their tanks, I tried to give them as much love and positive energy as I could. Sadly, these are the lucky ones. It’s the captivity industry that keeps the fishermen in the business of killing dolphins. Trainers come to the cove to pluck out the most attractive dolphins to sell to “sea parks” and “swim with dolphins” programs around the world. They can make as much as $100,000 for a dolphin. If we all stopped going to dolphin shows and marine parks like SeaWorld—not just in Japan but EVERYWHERE—we’d have a major impact. The next day we were in Osaka where we met up with local residents and formed another huge aerial art piece, this time with a dolphin and a human surrounding the Japanese symbols for “Health” and “Respect.” I spent time hanging out with everyone, letting them know why I had returned to Japan. I even learned a new dance—the Dolphin Dance. Everyone was amazing—it completely confirmed my belief that once these practices are widely understood in Japan, they will be rejected. Of course, there were a few people who didn’t agree with what we had to say, and I understand that. I don’t think we’ll change everyone’s minds in one day, but I hope we at least got people thinking. On our last day back in Tokyo, we were able to meet with some influential Japanese business and political leaders to discuss how we can better work together. I reiterated to everyone there that I love Japan, the Japanese people and their culture, and that I hope we can all work together to find common ground. 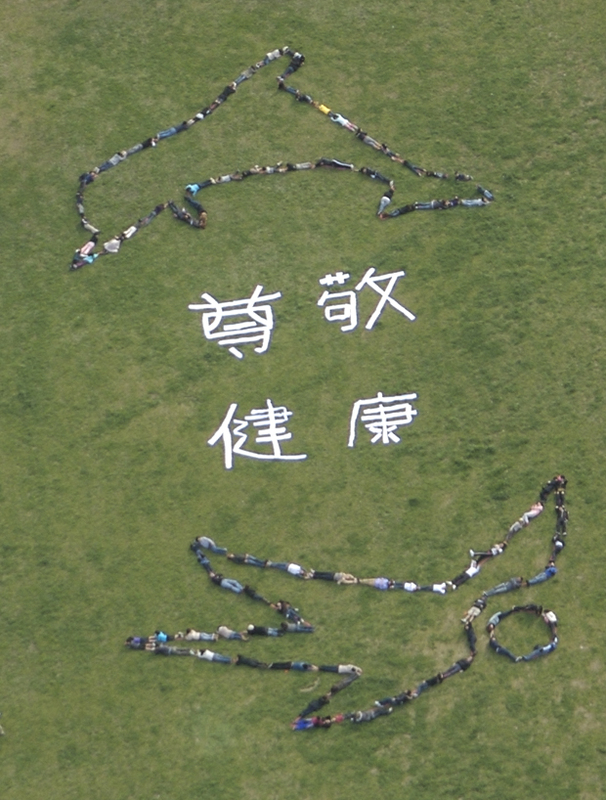 Aerial shot of people joining together in Osaka to form a dolphin with a human and the Japanese symbols for “Respect Health”, part of our “Save the Whales Again!” campaign. 1. Write, e-mail, or call President Obama and let him know that you want the US to use its sanctioning powers available under the Pelly Amendment against Japan, Norway, and Iceland until they stop killing whales and dolphins. White House Comment Line: (202) 456-1111. White House Fax Line: (202) 456-2461. President Barack Obama, The White House, 1600 Pennsylvania Avenue, Washington, DC 20500. 2. Write or call your US Representatives and Senators and let them know that you want the US to invoke the Pelly Amendment against Japan, Norway, and Iceland until they stop killing whales and dolphins. US Capitol Switchboard: (202) 456-1414. 3. “Click Here to compose and send your message” directly to the Japanese Prime Minister, Shinzō Abe. Hayden, where did you go ? We need your support now more then ever !